The Church of England has responded to the government’s Budget 2017 with a round of effusive applause. In a statement gushing with appreciation, the Bishop of Birmingham, the Rt Rev’d David Urquhart, who speaks on behalf of the Bishops in the House of Lords, lauded the fact that 3.5 million private sector jobs have been created since 2010, meaning that more people have the security of a wage and the dignity of employment. This was great news for millions of families, and the church likes families. And mindful of the biblical exhortations to avoid debt, the Bishop praised the Conservatives for cutting the deficit by over three quarters over the past seven years, which obviously helps to keep the economy strong, which benefits everyone. And the church likes helping everyone. Being a trainspotter, the Bishop was especially gleeful that the Tories have invested half a trillion pounds in transport infrastructure, including the biggest rail programme since the Victorians. The Bishop likes the Victorian era very much. Being a fan of ‘The Blue Planet‘, the Bishop was very much hoping that something would be done to cut the amount of plastic being dumped in the world’s oceans, so he was very happy indeed that Tories are taking action on single-use plastics that damage our environment. This will surely help to save baby whales. He likes sea creatures a lot more than he likes maths, but he does understand that maths is almost as important as theology, so welcomed the £600 maths premium to schools for each student who decides to study the subject beyond GCSE. He intends to write to the Chancellor to ask for consideration next year that RE be given equal treatment. If they can afford a whopping £500m to fund technology to keep Britain at the forefront of new technology and #fitforthefuture, there’s really no reason why half a billion couldn’t be found to keep Britain #spirituallyfitforthepresent. But this was the Bishop’s only quibble. He cheered the fact that from next April the National Living Wage will rise to £7.83, meaning full-time workers will be £2,000 better off since the Conservatives introduced it. Thanks to the National Living Wage, lower paid workers have seen their wages grow in real terms more than any other group, which is good news for the poor. The church likes helping the poor. And changes to Universal Credit will make a real difference to those claimants currently experiencing hardship. The church likes helping those suffering hardship. The Bishop cheered even louder that also from April the personal allowance will rise to £11,850, making a typical taxpayer £1,075 a year better off compared to 2010, ensuring people keep more of the money they earn in their own pockets. The church likes it when people keep more of their own money, so they can be more generous with it in church on Sundays. The Bishop also lauded the wisdom of keeping fuel duty frozen for the eighth consecutive year, meaning the average car driver is £850 better off since 2010. And he applauded the extra £2.8bn investment in the NHS (with an immediate £350m to prepare for the winter). The church likes it when the sick and infirm are cared for. Mindful of the importance of 5.5 million small businesses to the economy, the Bishop was very happy to hear about plans to bring forward the planned Business Rates switch from RPI to CPI to April 2018, which is worth £2.3 billion to businesses over the next five years. And he was even happier to hear about plans to invest £44 billion in house-building to deliver an average of 300,000 homes a year by the middle of the next decade – the biggest increase in supply since 1970. And to help the next generation buy a home of their own, the Tories are abolishing stamp duty for over 80 per cent of first-time buyers. This pleased the Church of England greatly, for home is where the heart is, and the church cares about people’s hearts. It is unacceptable in the 21st century that people are sleeping on the streets, so the kind and compassionate Conservatives are investing £28 million as part of their commitment to halve rough sleeping by 2022, and eliminate it altogether by 2027. The Church of England danced a jig over this announcement, and are inviting the whole Parliamentary Party to Lambeth Palace for Christmas drinks to express their appreciation, and to apologise for constantly slagging them off as the ‘Nasty Party’. Especially heartening to the Bishop was the good news that Conservatives are freezing duty on beer, wine and spirits, which will make their Christmas drinks (and communion wine) even cheaper. 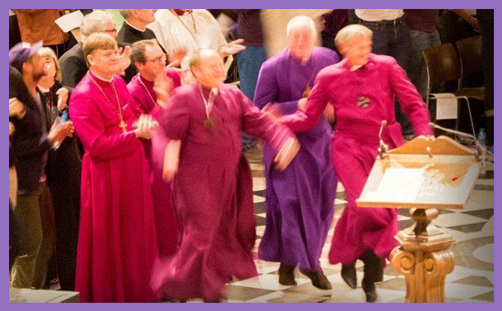 And he boogied all night when he heard that they are investing a further £3bn to prepare Britain for every Brexit eventuality (ie, ‘No Deal’), for all the Bishops are now conceding that the Bishop of Shrewsbury is a prophet of God. This wasn’t the Church of England’s response to the Budget?